We take a look at five popular small cars in the South African market and see just how safe the structures are for children in terms of Global NCAP safety ratings. When it comes to buying a vehicle, parents are most likely to look at safety features above anything else, either immediately or just after affordability. We take a look at five popular cars in the South African market and see just how safe the structures are for children. In South Africa, with the rate of only 3 in 10 cars being insured on local roads, according to the Automobile Association, we have to share space with a large number of unroadworthy vehicles. 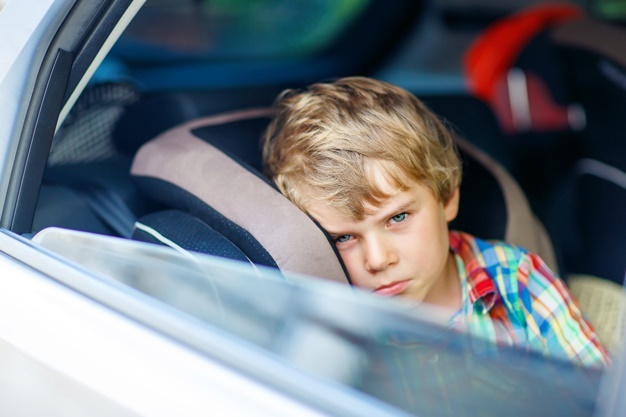 Most people can’t afford high-end vehicles with top safety features; nevertheless, it does not excuse children to be travelling without booster seats or child car seats. But, knowing how safe your vehicle is for your children gives you something to think about. Child seats are expensive yes, but there’s no compromise on the lives of little ones. We easily spend unnecessary money every month without even realising it, when every little bit put away can be saved towards a car seat before the birth of a child. A decent car seat is available for less than R1 000 from big retailers. Some organisations such as Wheel Well collect used car seats and distribute them for free to those who can’t afford to buy one. Arrive Alive’s Johan Jonck says: "Road crashes resulting in death and injury of children remain the most traumatic – not only for family and loved ones, but also for our first responders. The Arrive Alive Online initiative, in partnership with the private sector, will continue to emphasise the importance of keeping our children safe and plead with parents and adults to keep children well secured inside vehicles." South Africa does not have safety ratings on all vehicles in the local market; we largely depend on European NCAP safety ratings. The Automobile Association together with Global NCAP launched the #SaferCarsForAfrica campaign towards the end of 2017, marking the very first crash test assessments with some of the country’s most popular small cars in the local market. According to the AA, the combined sales of these five vehicles account for about 65% of all new cars sold in South Africa in 2017. The results of the crash tests indicate the differences in the structural integrity of the vehicles tested. 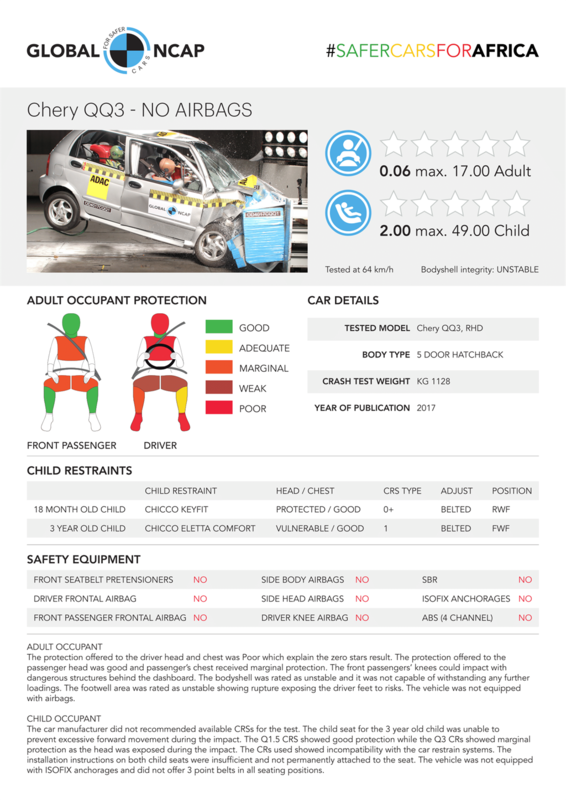 In doing these tests, the Global NCAP also awarded a separate child-safety rating to each vehicle in order to “highlight the different levels of protection vehicles provide to passengers on the rear seats”. The organisation says: “The only safe way for young children to travel is to be properly restrained in a child seat, therefore the assessment checks how compatible the car is with the child seats recommended by the manufacturer, as well as the protection provided in the crash test." The Sandero has a three-star rating for adult occupant protection in the frontal crash test at 64km/h. 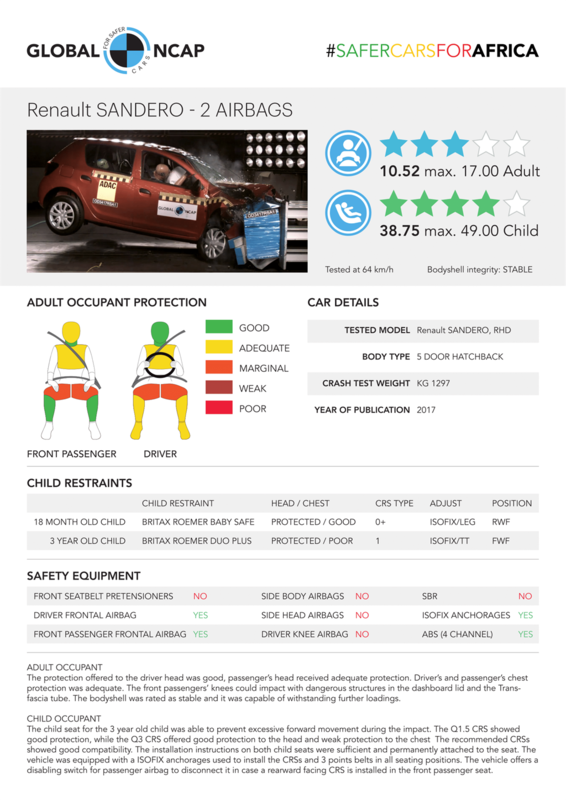 The Global NCAP rated the vehicle structure as stable, with acceptable adult occupant protection. The Sandero does not include seatbelt pretensioners; however, if using the child seats recommended by the automaker, the Sandero achieved a four-star rating for child occupant protection, which means your children stand a very good chance of less injury in a collision. While the Etios gets four stars for adult occupant protection, it has three stars for child occupant protection if using the recommended child seats. The vehicle structure was rated as stable and includes seatbelts with pretensioners for both front passengers. The Polo Vivo is South Africa's best-selling compact vehicle, exceeding sales of over 2 000 units monthly. The Polo Vivo achieved a three-star rating for adult occupant protection and also a three-star rating for child protection. 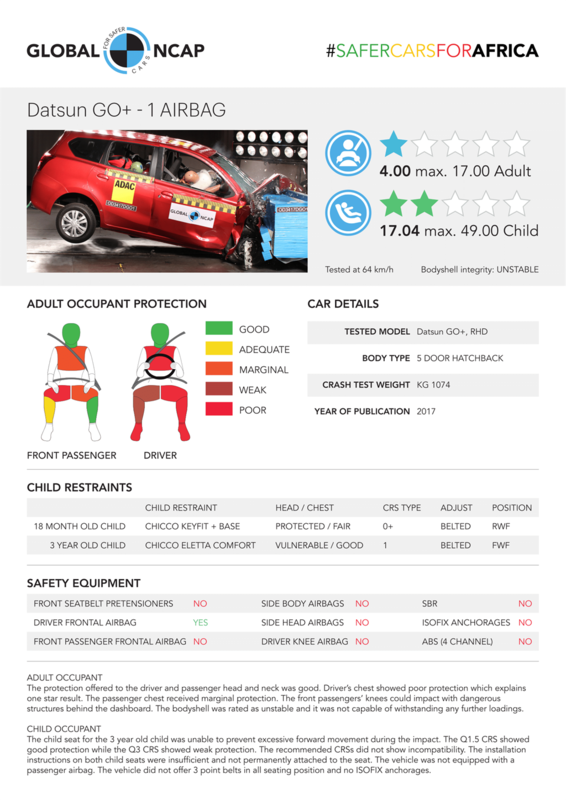 The Datsun Go or GO+ is an interesting vehicle because while it only achieved a one-star rating for its poor adult occupant protection, "mainly in the Driver chest in the frontal crash test", says Global NCAP, it has a two-star rating for child occupant protection using child seats. According to the organisation, the vehicle structure was rated as unstable, while steering wheel movement, even though a steering wheel airbag was fitted, recorded high compression to the chest of the driver dummy. It also has no passenger airbag. 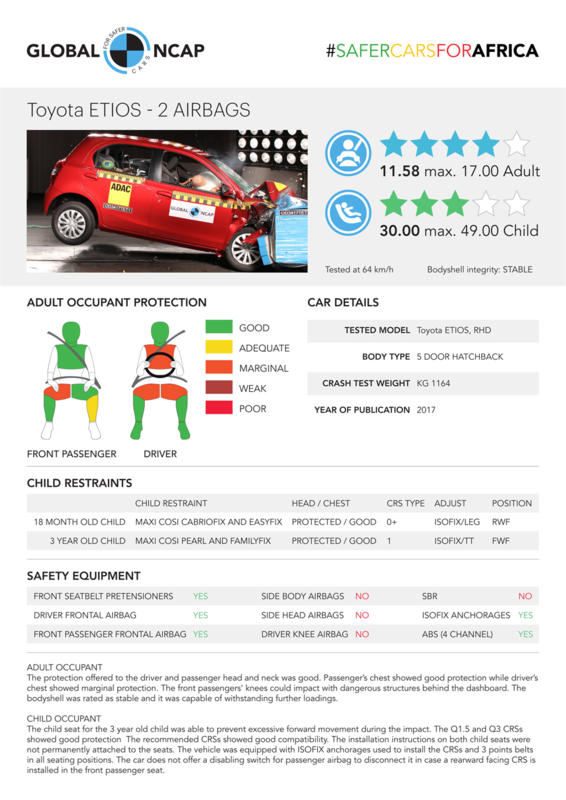 The Chery QQ3 achieved a zero-star rating for its poor adult occupant protection mainly in the driver’s head and chest area, and a zero-rating for child occupant safety due to the poor vehicle readiness to safely accommodate child seats. It also has no airbags at all. Global NCAP thus rated the vehicle structure as unstable because it collapsed in some relevant areas during the impact. "Injury impacts recorded in the dummy head and chest in particular led to this result. The manufacturer did not recommend specific child seats. This resulted in several points lost for child occupant protection." While this kind of information is not readily available for all cars sold in SA, it is worthwhile to do some thorough homework when considering which vehicle next to buy for your family. Look up European specifications albeit just a guideline for peace of mind. What brand car do you drive your kids around in? Do you feel they're safe? What features do you look for in a car when you shop for a new family car? Send your comments to chatback@parent24.com and we may publish them.